Find out why it was such a good month for shareholders in this discount retailer. 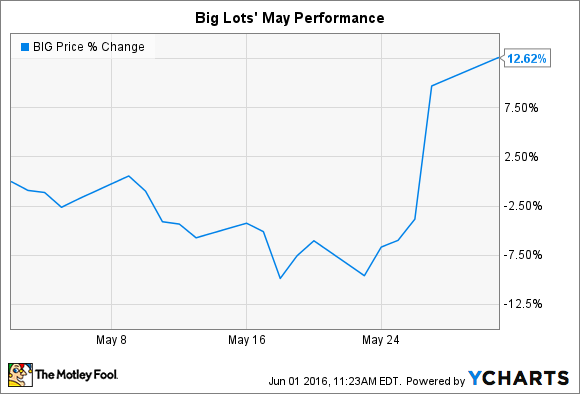 What: Discount retailer Big Lots (NYSE:BIG) jumped 13% in May, according to data provided by S&P Global Market Intelligence. The bounce contributed to a nice run for shareholders, who are now up 30% through the first five months of 2016. Big Lots is also beating the market over the past full year, with a 17% return compared to just a 2% uptick for the S&P 500. So what: Shares rose last month in response to a quarterly earnings announcement that showed the retailer is expanding at its strongest growth pace since 2011. Revenue improved by 3% at existing locations, or more than three times the rate it had seen over the holiday season quarter. That success put Big Lots in a small class of retailers, mostly on the discount side of the market, that are posting better growth these days as established full-price sellers like Target (NYSE:TGT) struggle. For its part, Target barely managed to break 1% comps, even though it benefited from the inclusion of a robust e-commerce business. Big Lots also had Target beat on profitability, with gross margin holding steady at 39% of sales compared to the retailing titan's 31%. The healthy margin figure implies that Big Lots didn't have to slash prices to keep its customer traffic figures churning higher. In a press release, CEO David Campisi credited "improved merchandise presentations and more consistent in-store execution" for the market-beating gains. Now what: Campisi and his team are hoping to keep the Q1 momentum going into the summer months through national merchandising initiatives that focus on its best product categories (like furniture) and a new private-label credit card to drive repeat business. The company didn't boost its sales forecast and still expects comps growth of around 2% in the current quarter and in the "low single digits" for the full year. Meanwhile, expenses are slated to rise as Big Lots pours resources into finally establishing its e-commerce presence. As rival retailers already get a significant chunk of their growth from online business, it's likely Big Lots will eventually see a similar boost. However, a cautious approach to the website roll-out will ensure that major benefits aren't going to begin accruing until 2017.